I've had several questions on how I watermark my photos. First, upload your photo to Picnik or, if you've already done that, go to your Library. 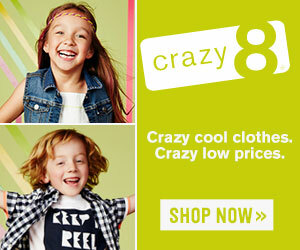 From this page you can crop or adjust colors. Next, click Create and then Text. Add your blog name or URL to the box and click Add. Finally, I change mine from "Normal" to "Overlay" so that the picture shows through the words. When you're done, just save it to your computer (Save and Share) and then upload it to your blog. Easy! I've decided to do this annually as long as there is still an interest! Last year, what I did was set up a MckLinky for all who wanted to participate. You entered in your blog address and then you choose 10 blogs (a day) from the list to comment on each day for one week, so by the end you had commented on 70 blogs (you can comment on the same one more than once or comment on 70 unique blogs). 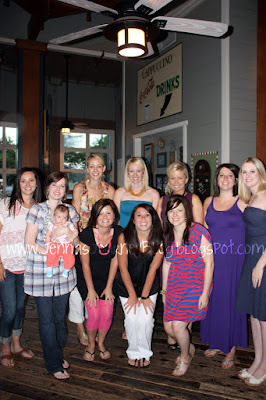 Many of you sent me great feedback on how you met new blogger buds and gained new followers. So, if you are interested in me doing this again this year, please leave a comment on this post. If there is enough interest I'll put up the bloghop either this week or next. I mentioned that our friend Melissa is moving away. Well, Friday we had a farewell playgroup for her at Sara's house! It was a swim playgroup but I guess I only half read the email because we showed us sans swimwear. Oops. 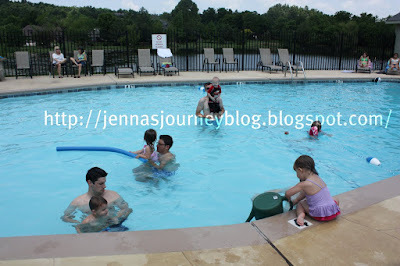 Thankfully, Sara had something Brayden could wear - too bad it was AFTER he dove into the pool fully clothed! 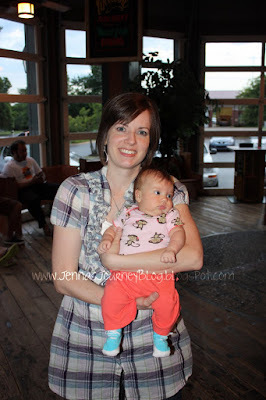 A big thanks to my friend Brittany (she is blogless but we are working on that!) for sending me all these pictures! I forgot my camera! Here's Brittany's son Xander with Brody. It was so cute - they were watching the bigger kids through the window. Sara is great at doing crafty things with kids and she came up with the idea to paint the kids hands, and then stamp it onto a canvas for Melissa's son to take with them when the move. It turned out so cute! Saturday we decided to go to a larger famers market about 30 minutes from us. It was a bust - I was looking for some already started lettuce plants but they didn't have any. Afterwards, we met Brittany, her husband James and Xander at a grilled cheese place - SO good! Does anyone grow lettuce? The seed packs said it takes 90 days - but on some of the other stuff I've grown, that has been wrong. Does it really take 90 days? Because my friend Melissa is moving. Not like, down the street or across town. More like a thousand miles away to another state, moving. We decided to have one last girls night out, and went to one of her favorite restaurants. 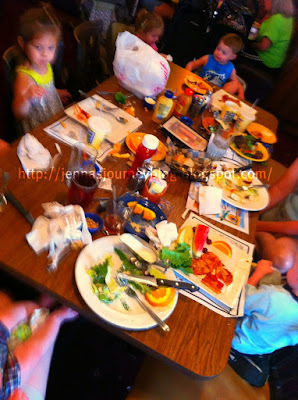 We had a great time, eating, laughing and of course talking! Melissa is one of the sweetest and most honest people you will ever meet - and she makes the best chicken pot pie EVER. I met her through MOPS and then we started going to the same playgroup. We have a lot in common and became fast friends. She has been such a great friend and I am going to miss her and her family so much!! Getting a picture of you for this post was quite the workout! I can't believe you are 7 months. Maybe I just don't want to believe it. You are growing up WAY too fast! 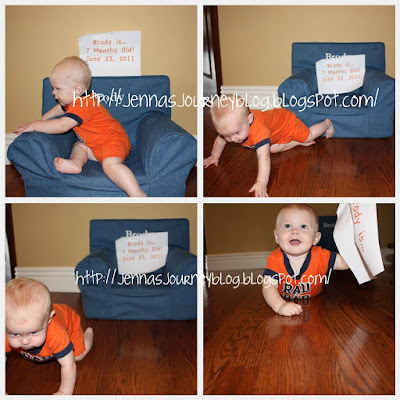 - You sit up on your own, unassisted for as long as you want now. - You started crawling. Everywhere. If I turn my head for 2 seconds you will be in another room! - Almost immediately after that, you started pulling up onto your knees. You'll occasionally get a foot underneath you as well. 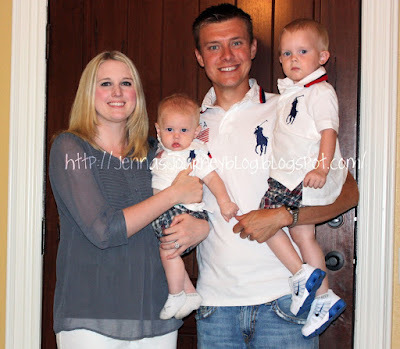 - You wear a size 3 diaper and 9-12 month clothing. - You weigh in at about 17lbs (50th percentile) and are 27" long (75th percentile). - You drink 7oz bottles every three hours during the day. - You sleep from 8pm - 7:30am now. You never wake up a night (knock on wood). - You.ADORE.Brayden. You watch his every move, you attempt to follow him wherever he goes, you get worried if he cries. You love him SO much! - You love to eat. A LOT. Any time we are eating you think you must also be eating. 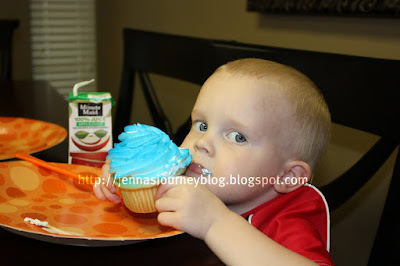 You eat baby food a couple of times a day but you prefer real food. You also inhale Puff's like they are going out of style. 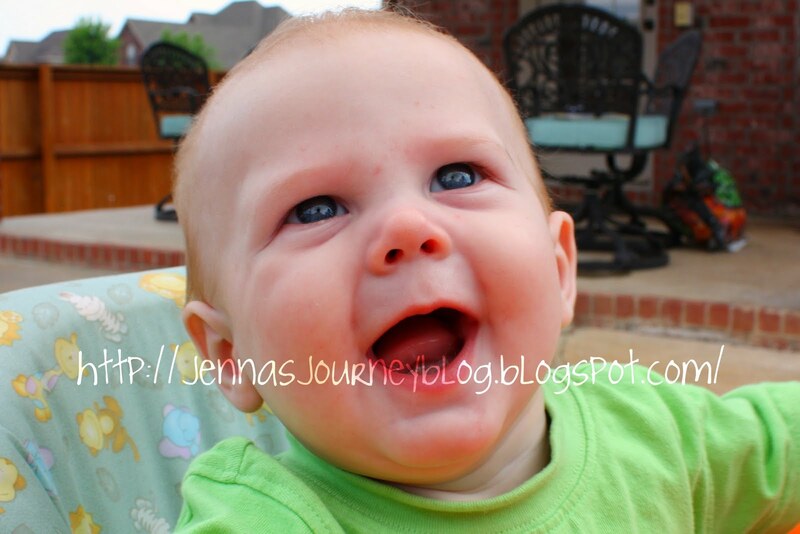 - You still have reflux but between your meds and the chiropractor, you are finally a VERY happy baby. - The trip to Dallas seemed to cure you of your car riding hatred. You no longer scream in the car. Woohoo! - We call you the alligator - because changing your diaper has turned into a wrestling match. You won't sit still! Ha! 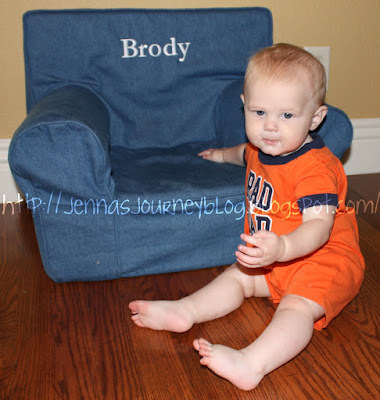 - Your nicknames are: Bro Bro, Brodster Roadster, Brody Bear and Brayden's favorite, BroBrosie. Lately I've been in a crafting sort of mood. I figured I should document it. Ha! So that wreath I made awhile ago? I've been meaning to finish it up. I saw this idea on a blog awhile ago (and lost the link...if you see it let me know so I can give credit!) and wanted to try it out. I had Chris get me a piece of wood, spray painted it, and then stenciled SUMMER on it. Then we drilled two holes, used floral wire and attached it to the wreath! 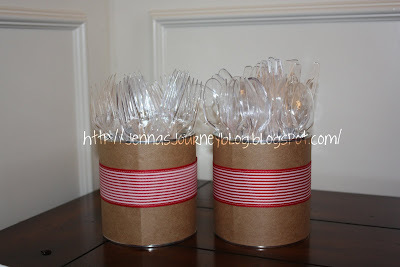 For the BBQ, I wanted something cuter than a plain cup to hold the plastic silverware. So I took 2 old formula cans and cleaned them out. Then I cut 2 stripes from the inside of a paper bag to be the right length and hot glued it to the cans. I used chip clips to hold it in place. Next I recycled some old ribbon from Brayden's first birthday party, and attached it for a little color! 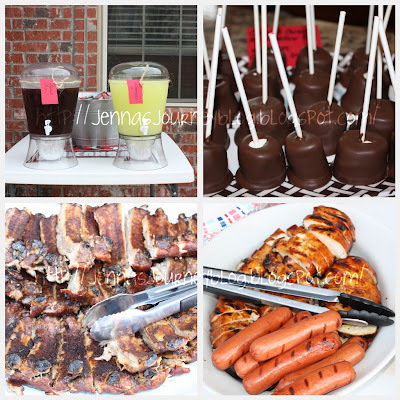 Here's a fun recipe for an outdoor party! 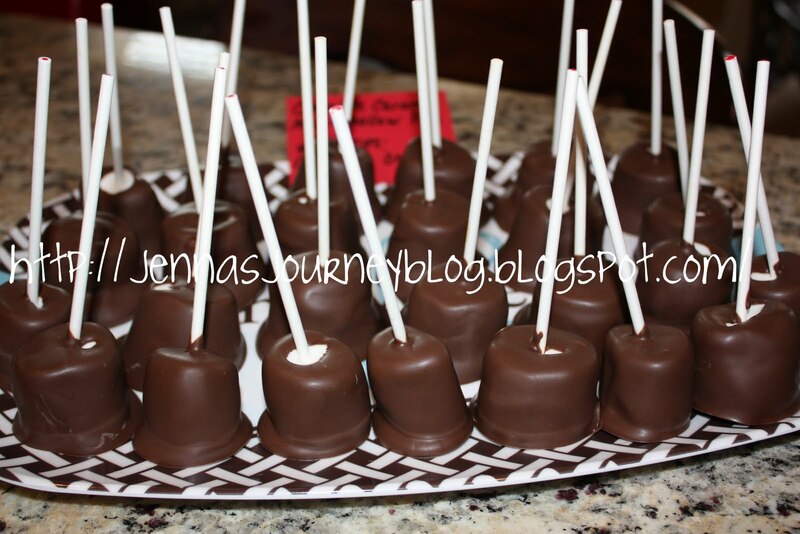 Chocolate Caramel Marshmallow Pops! First, prepare a baking sheet lined with wax paper. Spray the paper with PAM. Then spray it again. And one more time. When you think you've sprayed it enough, give it one more pass. Now you're ready. Next up, insert the sticks into the marshmallows. Don't poke it all the way through - just close to the end. 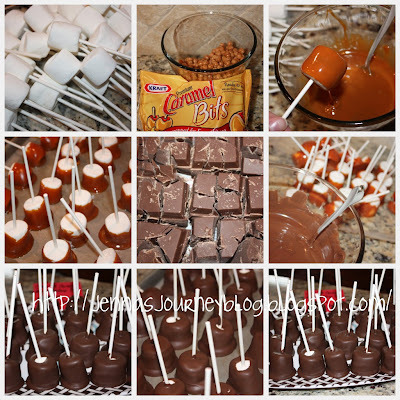 Follow the directions on the caramel bits. This stuff is great! Working quickly, dip the marshmallows, twirl, drain the excess and place them on the heavily sprayed wax paper. After this, I popped mine in the freezer because I was in a hurry. Once they've hardened, melt the chocolate, dip the marshmallows, and place back on the paper. They will set up in about 5 minutes. Serve! 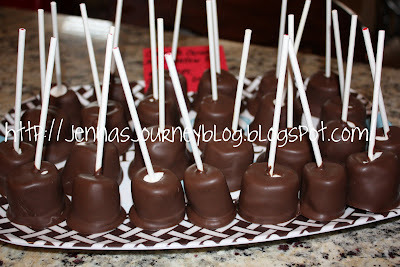 *Note: For the kids, I made some that were only dipped in chocolate. I marked the tips of those sticks red so that everyone could tell which was which. I thought the caramel might be too hard for them to chew. I considered topping them with crunched up graham cracker (smore's anyone?!) but I ran out of time. There are so many great topping ideas - crunched up butterfingers, sprinkles, etc. 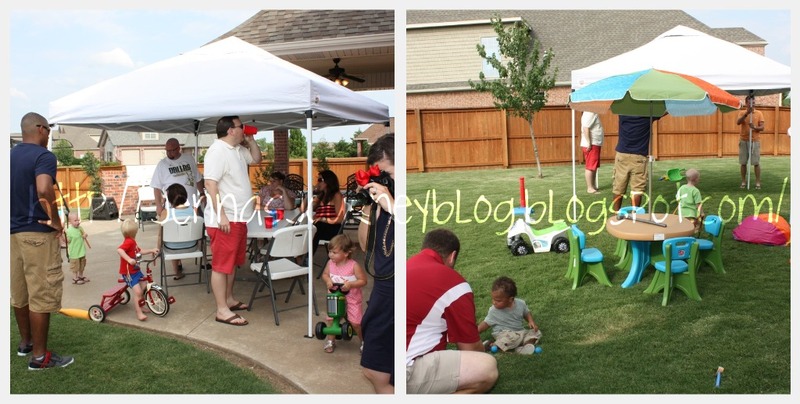 This past Saturday we decided to have a BBQ for our small group. Small group is sorta like Sunday school except we meet on Wednesday nights at someone's home, and the groups are much smaller than traditional Sunday school! We had such a fun time. Thankfully the weather wasn't overly hot, and there was a nice breeze out. We set up some outdoor games as well as a ton of toys for the kids and just hung out. I borrowed my mom's drink dispensers and tied twine around them with handmade labels. I also made Caramel Chocolate Marshmallow Pops - that recipe is coming tomorrow! And of course, Chris smoked ribs and grilled chicken! It was great to just hang out and relax and watch our kids play! I found the idea on Pinterest. I traced all of our hands and then framed the cutouts. He LOVED it! This evening we grilled out. We'll celebrate with my parents in a few days since they were out of town! I'm so thankful for a wonderful father who is a great example of what a Dad should be, and so thankful for Chris who is the best husband and father. I love you both! You may already know this about me...I am a HUGE So You Think You Can Dance fan! If I were 10 years younger and still in practice...and braver...I think I would try out (I danced pointe). Anyway, who are your favorites this season? 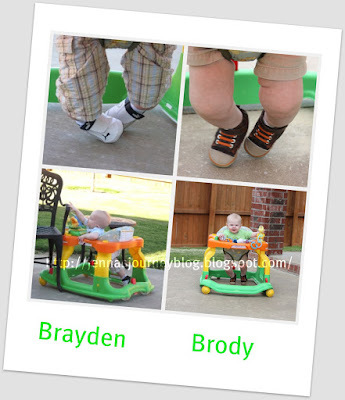 Brayden's on the left, Brody's on the right. My family loves these. 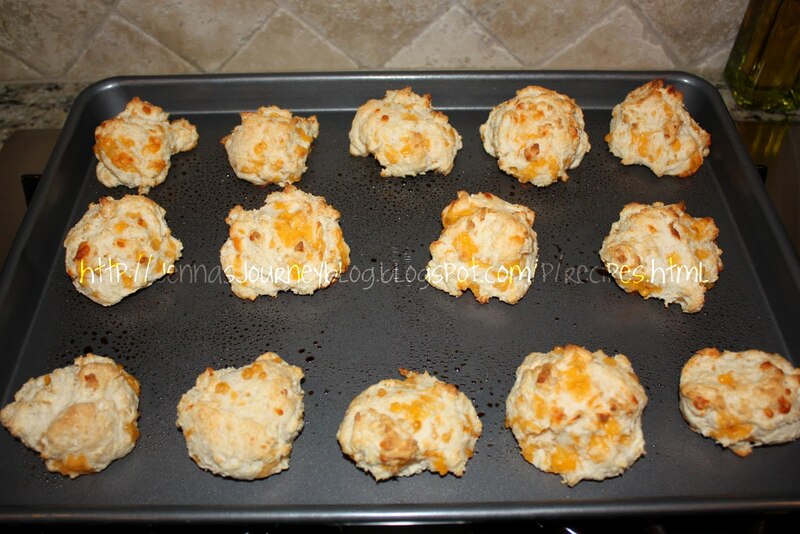 My mom has been making them for a good 20 years or more - they are similar to the biscuits at Red Lobster (yum!). Mix everything together. One thing I do that mom doesn't is I refrigerate it if I have time for about 15 minutes. It makes the biscuits puffier. Bake at 425 for 8-10 minutes. We had a super busy weekend! It all started Saturday when we went to Trevor's first birthday party! Isn't he cute? 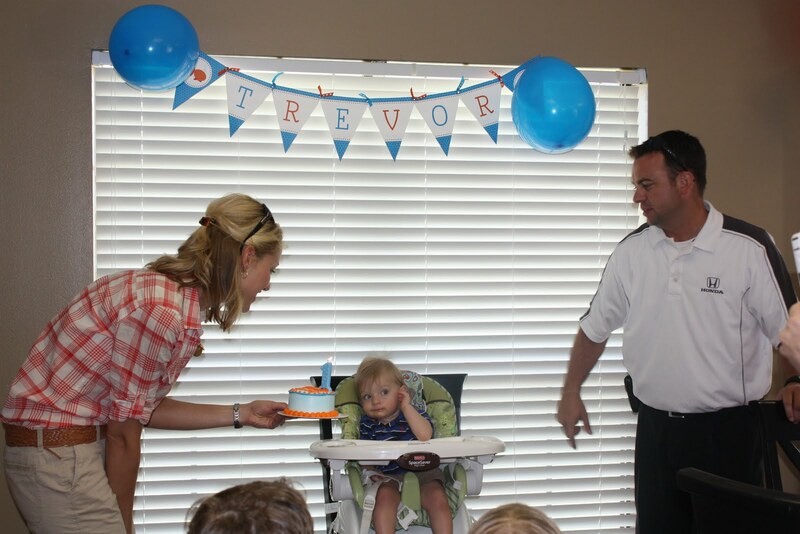 He had the sweetest little fishy swimming party. Brayden couldn't wait to dive into the cupcakes! This boy LOVES the water! I forgot both my and Brody's swimsuits so we stood on the sidelines and took pictures! Cilla kept playing with the watering can; it was so cute! I think she thought the concrete looked a little dry! That afternoon Chris' brother Jayce was coming up for a visit. He will be leaving for college soon so we wanted to spend as much time with him as we could! We had a BBQ and then hit up the TCBY for some froyo. Sunday my parents came home from Lake Tahoe so we spent the entire day with them, eating at Olive Garden for lunch and then smoking ribs for dinner! Afterwards we went to a great walking trail for a long walk with them and the kids. It was such a wonderful, relaxed weekend! Today I met up with my friends Sara and Sydney. We walked around the outdoor mall for a bit and then decided to have lunch at Mimi's. Actually, it went way better than I was anticipating! In fact, it would have been great if it wouldn't have taken 20 minutes to get the check - by that time people were starting to give us nasty looks. Personally, I think that when they saw the adult to child ratio going on at our table they should have given us a medal for bravery! 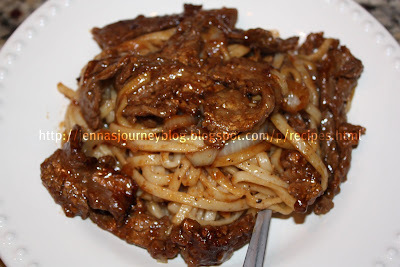 I've looked around for quite awhile for a beef stir fry recipe that we would like without much luck. I came across a Beef and Peppers recipe on the Pioneer Woman's site and changed it up a little bit to make it more our taste! If you want her original recipe it's on her site! For marinade and sauce - I did this in two separate bowls. The ingredients listed below are for 1 bowl - so you will need DOUBLE what is listed. One bowl will be to marinade the meat in, the other will be used for the sauce. Mix marinade ingredients and toss beef to coat. Let marinade for 2 hours. Mix sauce ingredients and set aside. beginning to soften, about 4-5 minutes and remove them to a plate. In batches, cook the meat adding additional oil if needed. Make sure to distribute the meat evening in one layer. Cook about 1 minute per side. 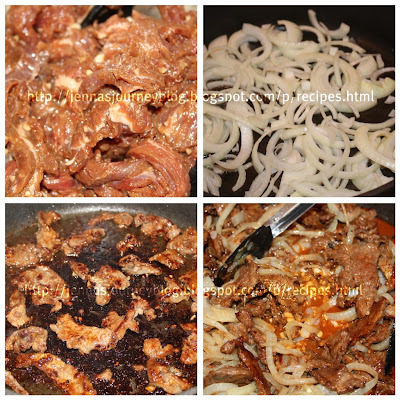 Once all the meat is cooked, add meat and onions back to the skillet – turned down to low. Add the sauce. Let cook until thickened. Meanwhile, cook Udon noodles according to package directions. Once cooked, add to stir fry. Toss to combine. Serve hot. 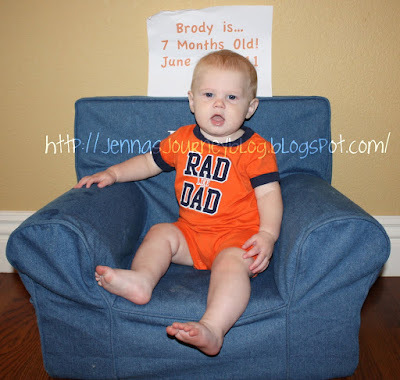 We finally went in for Brody's 6 month checkup last week and I never recorded his stats! You were 27" long (75th percentile) and 16.14lbs (50th percentile). You are right on track or ahead on all of your milestones. Dr. H was very impressed by the crawling demonstration you gave him on the table! I forgot to mention on your 6 month post that you LOVE it outside. You will even cry just because you want to go outside. Such a boy! I've been looking at some craft blogs lately as I'm working on a few little projects of my own. Pinterest has only added to my crafty feeling mood! There are SO many good ideas there! I've made a board of ideas for both boys birthdays (in November and January). One thing I need to learn more about is printables. I've seen a little about them, and some of my twitter peeps have sent me great info. 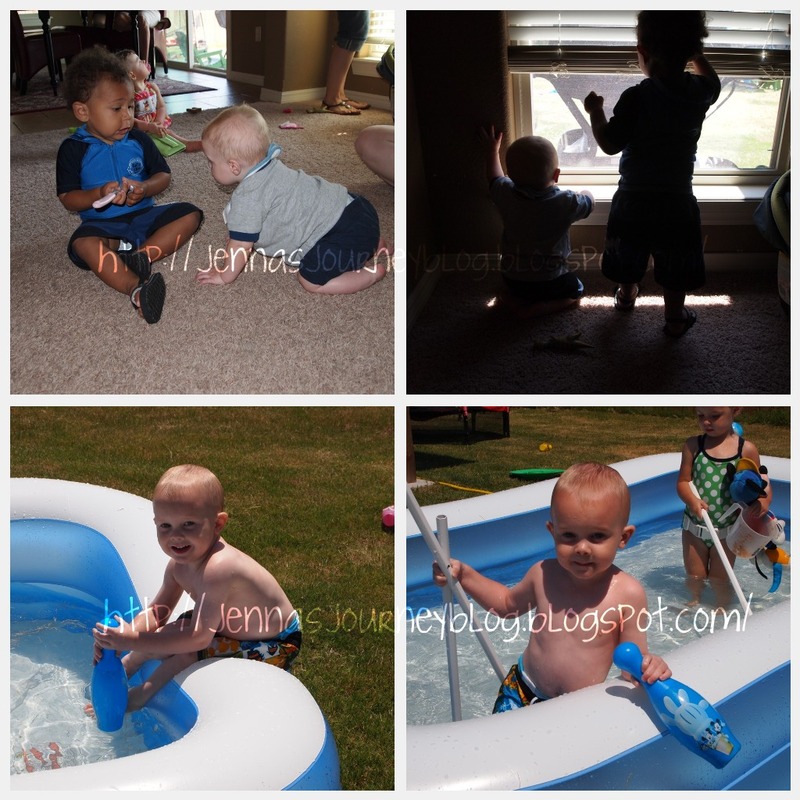 Where do you find free printables? Do you need special paper/ink? 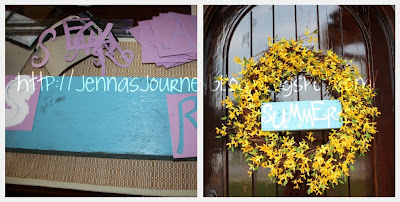 If you've used printables and posted about them send me a link! I'm trying to figure out how to use them in my party planning! We were over at my parents house last week and my mom made these AMAZING red velvet cupcakes! I haven't made them myself yet but I wanted to share the recipe because they were SOOOO good! Preheat the oven to 350 degrees F. Line muffin tins with paper liners. In a small bowl, sift together the flour, cocoa powder, baking powder, baking soda, and salt. In a large measuring cup, combine the buttermilk, food coloring, vinegar, and vanilla. In the bowl of an electric mixer fitted with the paddle attachment, beat the butter and sugar on medium speed for 1 minute, until light. Add the eggs, one at a time, and beat until combined. With the mixer on low speed, add the dry ingredients and the wet ingredients alternately in 3 parts, beginning and ending with the dry ingredients, and mix until combined. Stir with a rubber spatula to be sure the batter is mixed. Scoop the batter into the muffin cups with a 2 1/4-inch ice cream scoop or large spoon. Bake for 25 to 30 minutes, until a toothpick inserted in the centers comes out clean. Cool completely in the pans and frost the cupcakes with Red Velvet Frosting. Place the cream cheese, butter, and vanilla in the bowl of an electric mixer fitted with the paddle attachment, and mix on medium speed just until combined. Don't whip! Add the sugar and mix until smooth. I've been wanting to go to our farmers market for awhile but on Saturday we usually are pretty slow at getting around. Today Brody slept until 8 and Brayden slept until 9, but Chris and I managed to get up and have their breakfast and clothes ready to go, so we made it in time! And we got a lot of goodies! I bought lettuce, chives, fingerling potatoes and garlic and Chris bought some all natural, grass fed beef (brisket & ribs - to smoke, of course). We are now hooked and can't wait for next Saturday! There's a bigger market about 25 minutes or so from us that we might go checkout soon too! I'm still checking comments on the Pinterest post - if you need an invite just leave a comment. There's been a lot of discussion on Twitter about Pinterest. I joined awhile ago (and had to wait forever to get in!) but I just recently started playing around with it and learning how to use it. By the way, if you don't have a Pinterest account, the fastest way to get one is to have someone email you an invite. It's not like some sites where you get credits for inviting people (at least that I know of) it's just that the invite will get to you about 2 weeks faster than waiting for Pinterest to approve you. If you need an invite, leave me your email address in the comments and I can send you one. OK, so back to the "how to." At first I didn't understand the purpose of Pinterest. Basically, it is what it says - Pinning your Interests. So, the idea is you create boards and you "pin" pictures to them. I started one for each of my boys birthdays so that I can look at websites and find inspiration, and then pin the pictures I like to those boards. The easiest way to pin is to install the Pin It bookmark. Then when you are on a website and find a picture you like, you just click Pin It and the page turns into a bunch of boxes showing all the pictures. You click Pin It on each one that you want to add to a inspiration board. Another great way to find pictures is to "Re-Pin." If you have an account and click on the Pinterest logo at the top left of the page, it will show you pictures that your friends have recently pinned. You can re-pin them to your own boards. Using the People tab, you can find friends and invite them to join. They also have a free Pinterest app for iPhone! Using the Add tab, you can add new boards (Pinterest starts you with a few basic ones like "For the Home, Products I Love, Places and Spaces" etc. I added boards for recipes, birthday ideas, Outdoor and Christmas. So, I hope this helps you guys get started! You can click here to go to my pinterest! Leave me any questions or tips you have in the comments, as well as your email if you want me to send you an invite! Disclaimer - I was not asked by Pinterest to write this review. I wrote it simply because I like the site and wanted to share it with anyone who might want to use it. Lately I've been feeling all homemakerish, so I've tackled a couple of projects. First, I made this wreath. 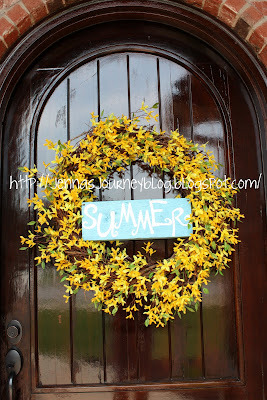 I used a plain twig wreath and attached all the pretty yellow flowers. I'm making a sign to sit in the middle of it that says Spring and another that says Summer. I got the flowers and the wreath on sale at Hobby Lobby so this project cost me less than $25! And I mentioned before that I'm growing an herb garden. 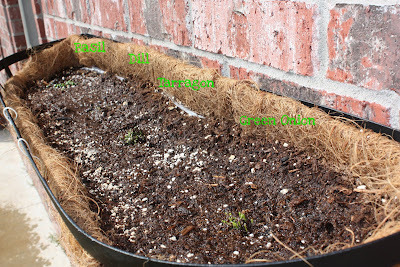 And, at 4 days in, Basil Dill, Tarragon and Green Onion have already sprouted! It's kind of hard to read - but I wrote which herb was which below! I'm just waiting on Parsley and Cilantro now! If you have any herb growing tips let me know! If this goes well I'd like to grow some other things we use a lot like onions and garlic, but I don't know anything about that! I'm not even sure if we can grow them here! Yesterday was a busy Tuesday! Our days always start with me making fresh pancakes for Brayden. He loves them! Then the boys and I packed up to go to Target. I have Brody's prevacid filled there since my regular pharmacy doesn't do compound prescriptions (which I'm guessing just means stuff they have to mix and let sit). for $25.11. The total before coupons was over $45.00 so that was pretty good! The best deals were the deodorant (one was free, the other was $1.59) and the wipes (I paid less than .50 cents for the box). Brayden was a very good boy so I rewarded him with Chickfila. I always get the Southwest Salad with ranch but when I got home I noticed they had given me spicy dressing (ironic as I was just telling Chris that they never mess up my order). I used maybe 1/4 of the packet because it was so darn hot! I'm going to get that from now on! Less dressing = less calories! Then we went out to play! 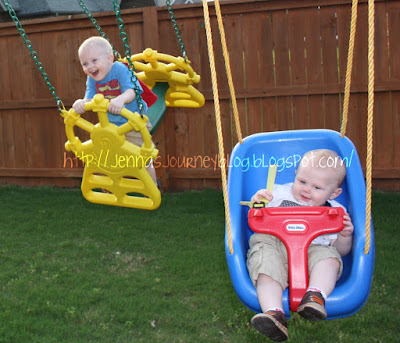 My boys love to swing!